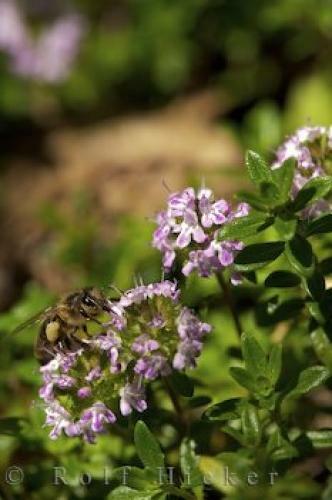 A bee perches on a thyme flower at La Source Parfumee Gardens in Provence, France in Europe. Thyme is a useful member of the Lamiaceae family, aromatic herbaceous perennial plants. Thymus vulgaris, the Latin name for the Common or Garden Thyme is found in the Mediterranean area of Provence and is one of the most well-known herbs in the world. Although bees produce some of the sweetest tasting honey from the Wild Thyme (Thymus serpyllum) all thyme varieties are prolific nectar sources. At La Source Parfumee Gardens near Gourdon in Provence, the thyme plants could be used for many things - the dried flowers can be used much the same as lavender - in a sachet, the oil for soaps and perfume - dried or fresh it is used for flavouring soup, stews and poultry. Parfumee Gardens in Provence, France in Europe. A bee on a Flowering Thyme plant, Thyme vulgaris at La Source Parfumee Gardens near the village of Gourdon, Gorges du Loup, Alpes Maritimes, Provence, France, Europe. I photographed this photo with the digital SLR camera model Canon EOS-1Ds Mark II, aperture of f/7.1, exposure time of 1/400 sec. on ISO 100, as always I used a original Canon Lens, the focus lenght for this picture was 180mm.